It’s really hard to judge a social networking app. On the one hand, plenty of people are suffering from Facebook fatigue, and there seems to be an opportunity for lesser known social networks to finally gain some footholds. On the other hand, a social network is only as good as the people on it…and if your friends aren’t part of the network, the experience can be a little hollow, even if the app itself is stellar. Bearing all that in mind,Keek (official website here) is a fun, polished app that’s perfect for sharing videos with your social network. 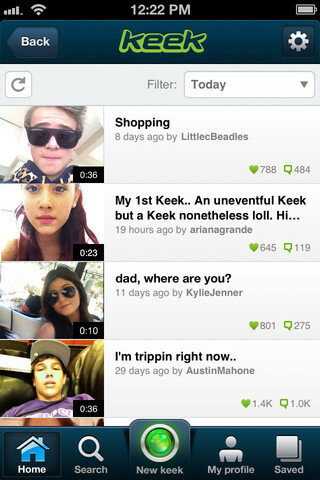 Lauded as “the Twitter for video-based status updates” by Techcrunch, Keek allows users to upload short video messages of juts 36 seconds each. That might not seem like much, but as with Twitter, you can do a lot within those confines. Keek is perfect for showing off a beautiful vacation vista, a delicious plate of food, a sweet new purchase from your latest spending spree, or just letting friends back home know what you’re up to. You can respond to other keeks (this is called a keekback). 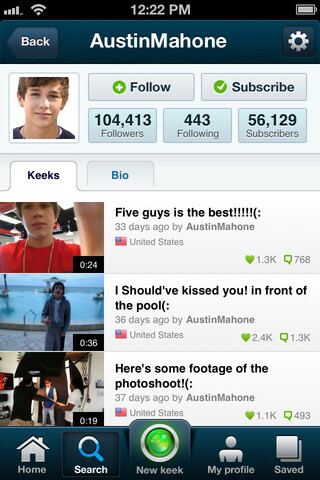 In addition, you can send private keek messages to any user that you follow who also follows you. 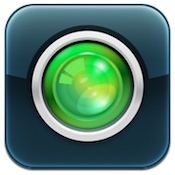 Unlike a lot of other social networking video apps out there, Keek sets itself apart by having all kinds of stats and leaderboards to follow. There’s a constantly-updated listing of the Top 100 users, as well as a pretty comprehensive analytics tool to see just how far your influence extends. With a streamlined notification center, clever networking model, and well-designed interface, you might just ditch your old school Facebook updates in favor of Keek. Not quite ready to cut the cord from other social networks? You can share videos via SMS, Email, Twitter, Facebook and Tumblr. Keekis compatible with iPhone, iPod touch, and iPad. Requires iOS 4.1 or later.